At its 94th session from 20th November to 8th December 2017, the UN Committee on the Elimination of Racial Discrimination (CERD) will consider the situation of racial discrimination in following 6 countries. 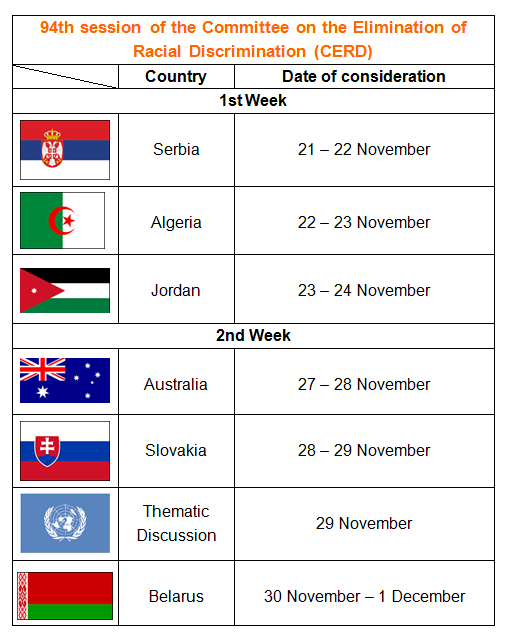 Civil society organisations (CSOs) are encouraged to submit information on Algeria, Australia, Belarus, Jordan, Serbia and Slovakia. The Committee will convene the thematic discussion on “Racial Discrimination Today” from 3 pm on 29th November. For States parties’ reports, list of themes and other documents, please visit the CERD’s session page. Watch and stream live discussions via the UN Web TV! Follow our twitter for live coverage of the session!